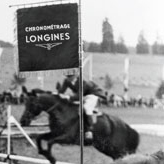 At first the La Grande Classique de Longines collection was introduced in 1992. 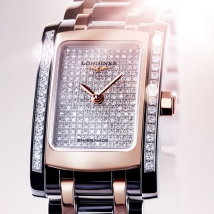 Since the models of this line became a symbol of classic elegance of Longines. Today, Longines presents new models of La Grande Classique de Longines 100 Diamonds, which combine classic elegance and radiance of 100 diamonds. Particular attention was paid to the ultra-thin case - its thickness is only 4.60 mm. The back cover of the novelties is also the bracelet fastening. The models are encrusted with 100 Top Wesselton VVS diamonds on the bezel and 12 diamonds instead of the hour markers on the blue, black or pearl dial, on which is installed a scratch-resistant sapphire crystal. A quartz caliber L209.2 (ETA E03.001) with functions of hours and minutes is mounted into a round steel case with a diameter of 29 mm. Water-resistant - 30 meters. The watch comes on a black alligator strap or metal bracelet with a stainless steel folding clasp.